The Dallas Sports Commission presented the 60th Annual Golden Chick Dallas Regional Spelling Bee on Saturday, March 24, 2018 at the George W. Bush Presidential Center on the campus of SMU in Dallas. 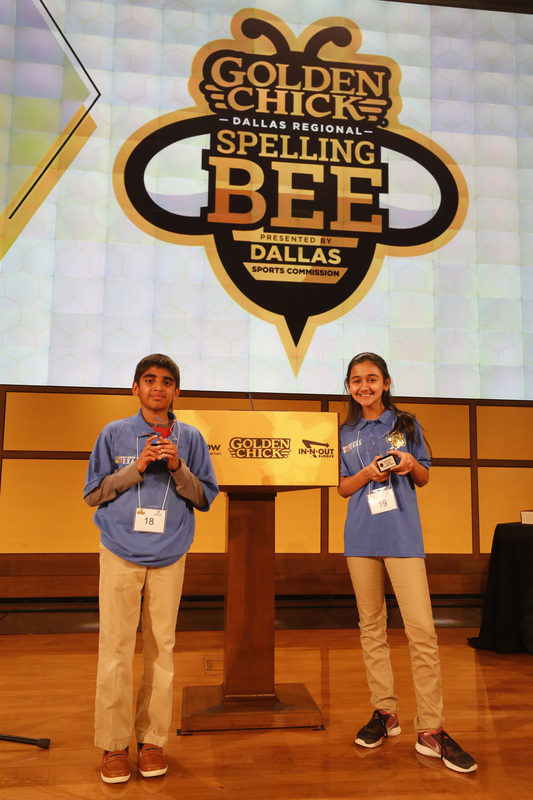 The 2018 co-winners, Naysa Modi and Abhijay Kodali, received an all-expense paid trip to Washington, D.C. to participate in the Scripps National Spelling Bee, one of the nation's oldest and most iconic competitions. Spellers were welcomed to the competition with a taped message from former First Lady Mrs. Laura Bush. The Dallas Regional Spelling Bee is open to 4th-8th grade public, private, charter, and home school students within the 35-county Dallas region to become part of the 11 million students who take part across the country every year. Go to www.dallasspellingbee.com for additional information. The 4th Annual Cotton Bowl Stadium Prep Showcase will take place on September 6 & 7 and features some of the Dallas-area's premier high school football programs. The 4th Annual Cotton Bowl Stadium Prep Showcase is a two-day, four-game event featuring eight 6A football powers inside the historic Cotton Bowl Stadium. Game announcements, dates and times will be made in the Spring of 2019. High Schools that have played in past Cotton Bowl Stadium Prep Showcases include Cedar Hill, Denton Guyer, Euless Trinity, Garland Lakeview Centennial, Jesuit, Lake Highlands, Mansfield Lake Ridge, Mesquite Horn, North Mesquite, Plano East, Rockwall, Rowlett, Sachse, Skyline and Waco Midway.